The courtesan Senju is dressed in a beautiful kimono decorated with gourds and autumn leaves - possibly ivy, see the delicate tendrils - overlaying a trellis like pattern. She is sitting on a bench which has sliding drawers on the front decorated with large peonies. When freshly printed the effect must have been stunning. Nonetheless, the design still speaks well for itself even after nearly 200 years. Inset on top: "San'yabori no Kihan" boats sailing back to San'yabori. 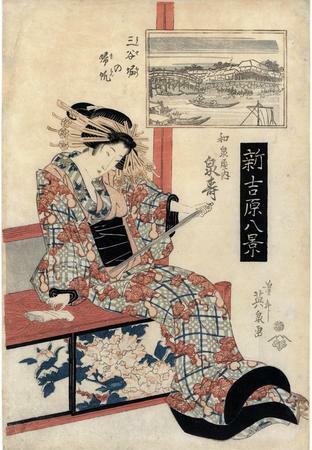 Mikhail Uspensky in his book on Hiroshige's 100 Views of Edo wrote: "In the Edo period it was customary to approach Yoshiwara by water. You could take a hired boat and turn from the Sumidagawa into the Sanyabori canal which took you almost to your destination. You could disembark earlier, by the Imadobashi bridge, which stood at the meeting-point of river and canal, to make your way to Yoshiwara on foot or in a palanquin along the Nihon-zutsu-mi ('Japan Dyke') that ran along the Sanyabori."